Flight engineers Cady Coleman, Paolo Nespoli and Ron Garan recorded a special congratulatory message for Prince William and Kate Middleton from onboard the International Space Station. Even the astronauts living on the International Space Station have caught royal wedding fever. While orbiting 220 miles (354 kilometers) above Earth, flight engineers Cady Coleman, Paolo Nespoli and Ron Garan recorded a special congratulatory message to the United Kingdom's Prince William and Kate Middleton yesterday (April 28) on the eve of their lavish nuptials today. "Even here onboard the International Space Station, we're following along with great interest," Garan said. "On the eve of the royal wedding, we just had a beautiful flyover of England. We took some spectacular photographs right at sunset. We'll be sure to share those photographs, as it was a beautiful sunset." Prince William and Kate Middleton announced their engagement in November, and tied the knot today (April 29) at London's famed Westminster Abbey. 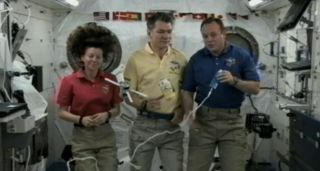 Coleman, Nespoli and Garan then waved and did backflips for the camera before signing off.The space station astronauts will next prepare for the arrival of the space shuttle Endeavour and its six-astronaut crew.